I became interested in blacksmithing in the fall of 2001 after a co-worker informed me of a blacksmithing guild that had a forge not far from where I lived. The Tidewater Blacksmith Guild (TBG) held monthly meeting on the third Sunday of every month and after that first meeting I became very interested in learning more about blacksmithing. After the $25 membership fee I would show up on Tuesdays and Thursdays watching and learning from the more experienced members of the guild. But it wasn’t until I attended Dan Boone’s Party in the Pasture that the spark for blacksmithing really ignited. Watching talented smiths working the metal and talking about how much they enjoy blacksmiths was a real inspiration to me. The more I learned about blacksmithing the greater my passion grew. The turning point in my blacksmithing ability occurred when TBG instituted an in-house training program. The classes consist of a Beginners, Novice, Intermediate and Advance courses. I also found that attending the public demonstrations for TBG was another good way to learn about blacksmithing. During these demo’s you get one on one experience with other smiths in addition to answering the public’s questions on what it takes to forge iron. I was awarded the first TBG scholarship and used it to attend a blacksmithing class at John Campbell Folk School in North Carolina. The class was Viking blacksmithing offered during Scandinavian week. I was working primarily at Taylor Farms two nights a week. This worked out ok but I knew if I was to progress I needed to build my own forge. So I had bought a resurfaced 186 lb. Mouse Hole anvil first, then I needed to set up a smithy at my house. I cleaned out my 12X12 shed and turned it into the Gentile Forge. Being able to work at home was a big step, it allowed me to practice blacksmithing after coming home from my “other job”. In 2005 I became president of TBG and really enjoyed the two year term. I’ve also served as the guild Secretary. During that time the guild was asked to demonstrate at the 400th anniversary of the founding of Jamestown, The event , Sail Va. 2007 was a four day demo in downtown Norfolk Virginia. In 2010 I co-founded Artist Blacksmith Group of Tidewater (ABGT) with Vince Nakovics. I am excited about this group because we will focus primarily on training and performing larger projects. 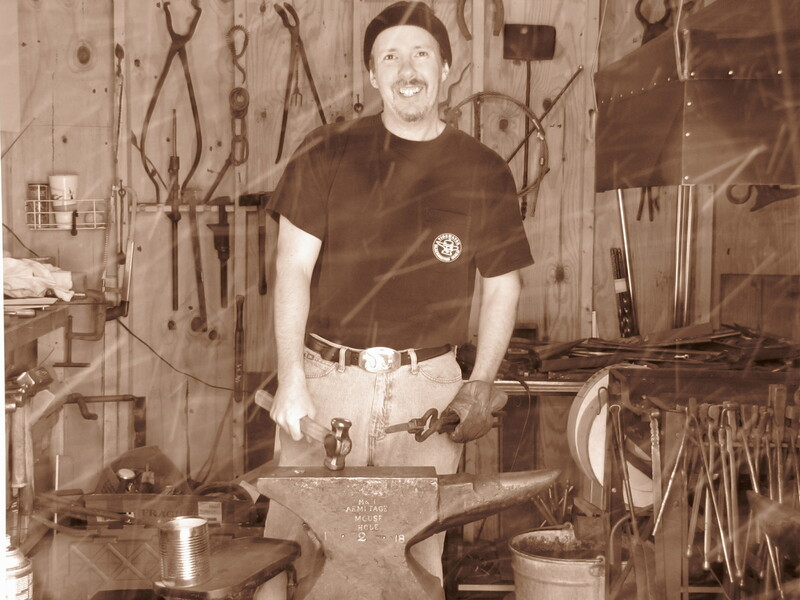 Vince Nakovics compiled a collection of interviews with Blacksmiths between 2007 and 2010. They tell how the ring of the anvil and crackling of the fire first enthralled them and drew them to the age old craft. They present their thoughts on “Traditional vs. Modern” techniques and on those who influenced them. These Smiths provide insight into the business of running a Blacksmith Shop. Being a blacksmith is one of the defining moments in my life, and a real passion, but none of it would be possible without the love and support of my wife. The following are a list of organizations I belong to, without them I would not have been able to pursue my passion for blacksmithing.